Ken Harvey was sent down by the Royals after losing his battle with Calvin Pickering for the DH job. Harvey was an All-Star last season after finishing the first half with 10 home runs, 34 RBI, and .305/.353/.452/.805 in the ratio department. Of course, he finished up the year with 3 HR, 21 RBI, and .256/.311/.366/.677. That made me wonder how often a player made the All-Star team, finishes up the season, and then was never heard from again. That is, assuming that Harvey's career is kaput. Paul Lukas has a remarkably detailed article on ESPN Page 2 documenting the minutest of uniform changes for 2005, truly remarkable stuff. Brian Schneider's habadasherial evolution, or the color of the Dodgers road uniform buttons, Lukas has it all. He also reviews the Washington Nationals new uniforms preferring the ones that his readers concocted to the genuine article. I have to say that I'm might partial to this one that features a map of the District of Columbia within a baseball diamond. Lukas also points out that the Nationals home uniform has a sleeve patch that disingenuously proclaims that the team was "Established 1905". The only reference to 1905 that I can find in DC baseball history is that it was the year that the official, but rarely if ever even mentioned, name of "Nationals" was given to the Washington team. 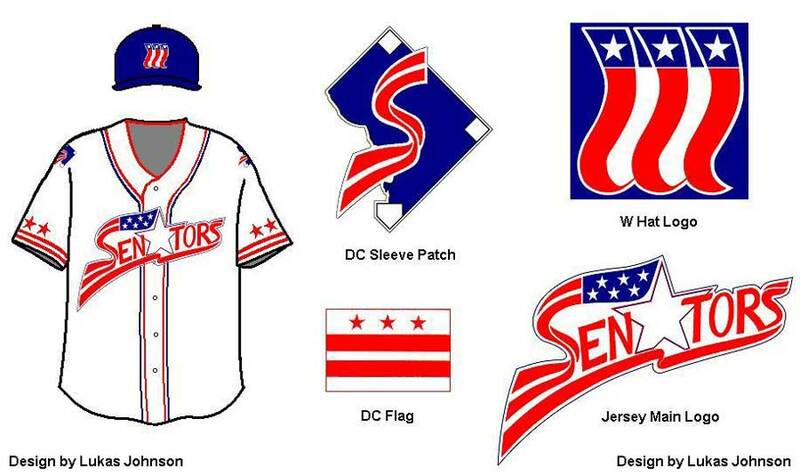 Of course, they were always known as the Senators and this date has the most tenuous of connections to the new Nationals. But then again, this is the sport that re-dubbed Estadia Hiram Bithorn the anglicized Hiram Bithorn Stadium. I have a guest appearance on The Baseball Analysts discussing the Braves dry spell of late in the postseason. Also, kudos to anyone who still laughs when they hear the word "duty". Blessed are they. Andres Galarraga retired the other day, shuffling off his Met-al coil with 399 home runs to his credit. I found it odd because I saw a Mets-Nats game the other day in which Galarraga went yard, as the kids are wont to say. That got me wondering how many players left the game within striking distance of a milestone. In the latest entry in the trade series, Studes looks at the biggest trades of all time. Surprise, Steve Jeltz for Jose DeJesus didn't make the list. As I await an other season of mediocrity in the land of the Phils, I am left wondering where the team would be if they could develop a modicum of decent pitching. The Phils have three potential starters who came from the organizationRandy Wolf, Brett Myers, and Gavin Floyd. Wolf has shown flashes of being a capable frontline starter and has on occasion drawn comparisons to Tom Glavine, but his career ERA is 4.13, just 4% better than the park-adjusted league average, and his career record is slightly better than .500 (59-56). The best that can be said of Myers is that he won 14 games two seasons ago. He owns an abysmal 4.84 ERA (14% worse than the park-adjusted league average) in two and one-half seasons. Floyd looked good in a brief call-up at the end of last season (3.49 ERA, 125 ERA+ in 28.1 IP), but it took a Padilla injury to secure him a spot in the rotation. Of course, that may be more an indictment of the Phils' decision makers than of his abilities. Then, there's Cole Hammels, who is sure to be a midseason callup in 2005. And of course staff savior Ryan Madson who rescued many a failed start as the long reliever last year. The Phils' future relies on these young pitchers, but given their history, I'm not sanguine. Our NL roundtable is up on The Griddle. Order up. William "Author" Shakespeare, Antony and Cleopatra. "It's time for them to look in the mirror and recognize that they're the ones who have to perform," Green said. "It's not the manager that has to perform. They can blame [ex-manager Larry] Bowa for last year, but now there's no one to blame. "I think they're smart enough to realize that the onus is on them. Quit barking and whining. Stop worrying about the ballpark, the manager and the pitching coach and play ball. And win." He pulled the same crap in 1980. He opened training camp with "There's no I in Team" and things went downhill from there. He alienated the players and in turn the team hated him right back. But it wasn't one of those inspirational types of hatred, like George Scott employed to motivate his troops in "Patton". The Phils meandered for three quarters of the season that year. As a matter of fact, on August 26, 1980, after the Phils lost two in a row by the same abysmal score,8-4, to the Dodgers at home, they were in third place, 3 and one-half games behind Pittsburgh and three full behind Montreal for second. They ended up winning it all after Ron Reed and a few others led a meeting to win in spite of Green. And then Green becomes a local legend even though his greatest accomplishment in the game was fleecing the Phils out of Ryne Sandberg as the Cubs' GM a couple of years later. Roberto Alomar quietly, and mercifully, retired from the Devil Ray camp last week. Now, I'm not going to try to convince you that Almoar was a Hall of Famer. I believe that his inclusion among the game's greats is a fait accompli. The question remains whether he will be a first-ballot type or have to wait like fellow second baseman Ryne Sandberg, who seemed a no-brainer as well. We'll find out around 2010. Given the psyche of the average Hall voter, instead of plumbing those depths, I'd rather focus on two other questions regarding Alomar's career. My first question is where Alomar ranks among the great second baseman. Second, I have to wonder where he would rank if not for his precipitous fall after being traded to the Mets in 2002. [L]et me say that should [Hall of Fame] voters be pompous and self-righteous enough to deny Mark McGwire or Barry Bonds his plaque in Cooperstown; it will be their downfall. After looking at the best and worst transaction in the Phillies' history, I noticed that the Phils even with all their many past failures on the field came out in the black in Win Shares traded. They were up almost 4000 Win Shares Above Baseline (WSAB). How could arguably the worst franchise in baseball history come out ahead in transactions? Then it occurred to me that even a poor team over time will come out ahead in transactional Win Shares. They have to. If you draft a future superstar and trade him away before he makes it big, the worst the team can do is break even: the career Win Shares they picked up in drafting the player at least equal those traded away. Take Sandberg, for instance. In drafting him, the Phils pick up 199 WSAB. In trading him they lost 196 WSAB. So even one of the worst trades in baseball history results in a net of 3 Win Shares for the Phils. —William "Author" Shakespeare—Get it? Bonds? Barry Bonds, as you've probably heard, suffered a setback in rehabilitating his knee, requiring additional surgery, and now may miss the entire season. Bonds though is blaming the press—"I'm tired of my kids crying. You wanted me to jump off a bridge, I finally did. You finally brought me and my family down. ... So now go pick a different person. "—as well as Lili Von Shtupp-esque, excessive ennui. Given the BALCO situation and Congess's interest in the soft issue of steroids, some will speculate that the steroids had something to do with his situation. Certainly, the media's coverage of that subject is one of the major reasons that Bonds feels picked on. What else the juice has to do with Bonds' lack of vim is pure speculation—like that would stop anyone from speculating. If Bonds does miss the entire 2005 season, what are the odds he could come back next season at age 41? Date: Prior to the 1901 Season. Transaction: Nap Lajoie jumped to the Philadelphia Athletics. Goodbye, Larry. Maybe if the Phils had called themselves the Naps, he would have stayed put. On June 8, 1971, the Phils drafted a shortstop from Ohio University "with two bad knees and a dream of becoming a big-league ballplayer" in the second round, right ahead of a third baseman by the name of George Brett. That draft pick would eventually become the best transaction the Phils ever made as Mike Schmidt—he was the pick if you couldn't tell by the reference to the maudlin speech—became arguably the greatest third baseman ever to play the game. In the offseason prior to the 1901 season, the Phils' twenty-five-year-old starting second baseman jumped to the Philadelphia franchise in the newly major American League. As the Phils fought to bar Nap Lajoie from playing in the state by the next season, AL president Ban Johnson had Lajoie sold to Cleveland where the locals dubbed their nine the Naps. Lajoie would play another 16 seasons in the AL and, of course, go into the Hall of Fame. This would be the worst transaction in the Phils' history. That is the best and worst the Phils ever did in acquiring or losing talent. So what's in between? I make them feel confident, and they make me feel safe, and pretty. 'Course, what I give them lasts a lifetime; what they give me lasts 142 games. Sometimes it seems like a bad trade. But bad trades are part of baseball -- now who can forget Frank Robinson for Milt Pappas, for God's sake? —Annie Savoy in "Bull Durham"
Actually, Pappas et al-for-Robinson wound up tied 108th worst in my lopsided study since Pappas was a pretty decent pitcher after that. That trade doesn't even compare with Glenn Davis for Curt Schilling, Steve Finley, and Pete Harnisch. Schilling is the hero of Beantown because of his postseason heroics. Finley has 285 career home runs. And Harnisch, though not as successful as the other two, was an All-Star his first year in Houston and won 45 games in four years as an Astro. Davis played parts of three seasons in Baltimore appearing in just 185 games and hitting a meager 24 home runs over that span. However, the one criticism I heard continually about the study on lopsided trades was that the Davis trade could not be the second most lopsided ever because Houston never got the best years from the two best players in the deal. The 23-year-old Schilling lasted one year in Houston's pen. Finley played four seasons in the Astrodome but was nowhere near the power hitter he is today—his top home run total as a 'Stro was 11. This was because I looked at the total value of the players involved over the rest of their careers. But, in the Yankee-KC A's analysis, I created a stat to look at how the traded players performed just for the teams to which they were traded, Interstitial Win Shares and Interstitial Win Shares Above Baseline (WSAB). So that it doesn't sound so highfalutin, let's just call them Team Win Shares and Team WSAB. Trade: Boston sent Jeff Bagwell to Houston for Larry Andersen. This replaces the other big Houston trade, the Glenn Davis trade, at number two. No matter what Bagwell does in Houston, he won't make up the 100 WSAB difference that separates this from number one. When we last left our heroes, the New York Yankees and Kansas City A's, I introduced the concept of Interstitial Trade Value. The idea was that the Yankees used the KC A's as a means to develop talent, as am affiliate club in the major leagues ostensibly competing directly with the Yankees for a championship. Interstitial Trade Value is a means to evaluate their incestuous interconnected trades in terms of what each team received in the interstices, the slices of time that each traded player performed for that team. The only problem was that I hadn’t yet perform the data analysis to produce actual results. Well, that problem has been rectified. I now have a balance sheet of interstitial Win Shares and Win Shares Above Baseline (WSAB) for all 27 transactions between the two teams. The first thing that struck me was that even though the Yankees "won" overall by about 71 Win Shares, but had an even larger edge in WSAB (79.32). That's something you don’t see in trade histories. A team just doesn’t get that much more WSAB, i.e. high-end talent, than Win Shares. Clearly, the Yankees were traded quantity for quality. The Yankees really didn't outdo the A's in that many of the transactions (They both had advantages of at least 3 WSAB in three transactions and both "won" seven transactions in WSAB). They just clobbered them in the ones they did "win" though. Trade: A's sent Bobby Shantz, Jack McMahan, Art Ditmar, Wayne Belardi, and two players to be named later (Clete Boyer, June 4, 1957 and Curt Roberts, April 4, 1957) to the Yankees Irv Noren, Milt Graff, Mickey McDermott, Tom Morgan, Rip Coleman, Billy Hunter, and for a player to be named later (Jack Urban, April 5, 1957). Bobby Shantz and Clete Boyer for not a whole lot. This one we know was a setup. Boyer was signed by the A's to a $40 K bonus in 1955 at the behest of the Yankees, the team later admitted. Note that the performance prior to the trade favors the A's and after favors the Yankees. This is the prototype: trade age and quantity for youth and quality. Trade: A's sent Roger Maris, Joe DeMaestri, and Kent Hadley to the Yankees for Hank Bauer, Don Larsen, Norm Siebern, and Marv Throneberry. The 37-year-old Bauer would play parts of two seasons with the A's, and Larson would go 2-10 in less than 100 innings in a little over a year. Siebern was a productive player for four seasons in KC. Maris would win two straight MVPs over the next two seasons, and, oh yeah, he would break Babe Ruth's single-season home run record in two years. This may even be a better example of Yankee-KC trades than the first. The Yankees traded bigger names to get the player they needed. It's telling that they lost the post-trade career Win Share battle, given that they gave up four players. The won the Interstitial battle and the post-trade WSAB battle. Trade: A's purchase Bob Cerv from the Yankees. Casey Stengel famously informed Cerv of this trade by saying, "Nobody knows this, but one of us has been traded to Kansas City." Cerv was one player for which the Yankee strategy never worked. He was a decent bench player in New York until age 30. Then after being exiled to the A's he had two monster seasons (1958 38/104 /.305 and 1959 20/87/.285). In the middle of the next season, the Yankees traded to get Cerv back. He gave them an average half-season and then was drafted by the expansion Angels. The Yankees must have acquired a taste for Cerv because they traded to get him back mid-1961. He was stinking up the place (.118 BA) by 1962. Like Marty Fufkin, the Yankees had no timing where it came to Cerv. Trade: A's sent Ralph Terry and Hector Lopez to the Yankees for Jerry Lumpe, Johnny Kucks, and Tom Sturdivant. The Yankees get Terry back after sending him to KC for seasoning. Lumpe turned into a decent middle infielder for the A's, but that was really a surprise. Trade: A's purchase Tom Gorman from the Yankees. Gorman was another superfluous player exiled to KC. He had a decent career as a reliever and part-time starter there, but never performed so well that the Yankees tried to get him back. The rest of the transactions resulted in no more than four Interstitial WSAB. So that's it. The Yankees clobbered the A's with those three big trades. The A's got a couple of decent players shipped from NYC. It seems kind of anticlimactic, but it does establish a pattern that at best does not speak well of the A's decision-making. Given that the Yankees were typically shipping bench players or marginal starters to and from the A's, the rest of the trades really don't seem to make much of an impact. [L]ike so many trends that cycle through life and baseball, the running game is coming back. They site the Marlins' World Series win from two seasons ago, the Padres' acquisition of ALCS stolen base hero Dave Roberts, Ozzie Guillen's re-imaging of the Chisox, and Omar Vizquel's ill-conceived signing in San Francisco. I read the article and thought, "Hmm, could the stolen base be making a comeback unbeknownst to me?" Hey, if Terri Hatcher, bell bottoms, and Aerosmith can make comebacks, why not the stolen base? The only trend that I see in the data is with the ratio stats. OPS took over as the power surge of the early Nineties took hold. By the end of the Nineties, Billy Beane's favorite stat OBP seemed to be eclipsing OPS, but then OPS took over again and Slugging quickly passed OBP. Meanwhile, stolen bases and stolen base percentage have had very little to do with scoring over the last fifteen years. They had a slight correlation (esp. SB%) from 1999-2003, but slide to actually a very slight negative correlation last year. If anything, the stolen base had less to do with scoring in 2004 than they had in the previous six seasons. But maybe looking at the team stats gives an incomplete picture. What about leadoff men? Maybe having one that can steal an extra base from time to time leads to higher scoring? So, basically nothing correlates well to scoring from the leadoff spot. Surprisingly, slugging average correlates the best though not well at all. Most important, stolen bases and stolen base percentage have apparently nothing to do with high scoring from the leadoff spot. They are the two lowest on the board. Besides the top stolen base total was for Milwaukee, one of the lowest scoring teams from the leadoff spot. My conclusion? It was a slow news day at MLB.com. There's no empirical evidence that the stolen base is back. But I wouldn't mind if they did over the next few years if it helps the underrated Tim Raines get into the Hall. Danny Gardella, who was involved in a once-famous case against baseball reserve clause, died last week at age 85. Gardella's was probably the most serious challenge to the reserve clause between Monte Ward's and Curt Flood's. Gardella was banned from the majors for "jumping" to the brand spanking new Mexican league in 1946. Even though he hit 18 homers in 1945, with more players returning from the war, Gardella had expected to be sent back down to the minors and instead decided on trying the new league. Gardella changed his mind and attempted to return to organized ball but was rebuffed. Commissioner Happy Chandler had already issued a suspension for all jumpers to the new rival league. Gardella sued, claiming that he had not signed a contract for 1946, so the only thing holding him to his ‘45 team (the Giants) was the reserve clause. Gardella won in the Federal courts on appeal and baseball settled with him out of court in 1949 (for $29 K). Gardella returned for one game with the Cardinals in 1950. Much of this has been reported. However, a rather salient point never seems to get much coverage. Perhaps expecting a rather shortlived interleague battle, Chandler issued the mandatory suspension for just five years. Gardella's case was settled just in time for the 1950 season. Had he just waited out the suspension, he might have returned at the same time. Another odd story about Gardella was that he once shocked his roommate with a fake suicide note. When the roommate read the note and saw an open hotel window, he immediately rushed to the window only to find Gardella waiting on the ledge to surprise him. And you thought Ashton Kutcher was cruel. My friend Chris informs me that I was listed in the bibliography section of one of the articles in this year's Baseball Research Journal from SABR. I just received it the other day but had yet to really peruse it. The article is "The Worst Team Ever?" by Jerry Nechal in reference to the 2003 Tigers. At the end of 2003, I took a look at the execrableness of the Tigers, among other random issues, and found them to be the worst team ever. I called the article "End of Days: Detroit!?! No, Not Detroit! ", a reference to the late, great "Kentucky Fried Movie" of Big Jim Slade fame. Alas my site didn't even get a plug since the author referenced another that re-packaged my stiff about a year ago. However, I still think it's hilarious that the old KFM reference made it into a bibilography next to the likes of Baseball-Reference, Robert Creamer, and Fred Lieb. To quote the incomparable Yakov Smirnoff, "What a country!" The other day while reviewing Rick Ankiel's stunted pitching career, I investigated all-time pitching wildness. One thing that I noticed was the fact that what was considered "wild" varied greatly depending on era. Given that, I broke out the best and worst dependent on approximately 25-year periods. But this led me down a different path entirely. I continued evaluating wildness adjusted for league and year average and deciding to throw strikeouts into the mix. What I ended up with is, I believe, an index for pitching power and control, which I thought was pretty cool. I used the league average to estimate the expected incidents of wildness (non-intentional walks, wild pitches, balks, and hit batsmen) for each pitcher in every year. I, then, used this to calculate the career Wildness per nine innings pitched above expectation for every pitcher (min.200 innings) along with his strikeouts per nine innings above expectation. Here is a rundown of the "wildest" and "mildest" per era (approx. every 25 years) based on the stat from the Ankiel research. This is followed by the current wildest/mildest-ers. The other Baseball Toaster feeds are here. As of today Rich Ankiel is no longer going to be cut by the Cardinals as a pitcher. He's going to be sent down this time with the designation of outfielder in front of his name. Ankiel, a career .207 hitter, announced that his pitching days are over. Surprisingly, his pitching coach Dave Duncan was caught unawares—"I've been trying to get him ready to pitch". He added, "Doh!" Ankiel will be remembered as promising pitcher who had problems with wildness, was stalked by the media, and had his share of injuries. I can't say what kind of outfielder he'll be remembered as, but I don’t expect that his second career will add much to his baseball epitaph. So, yeah, Ankiel was wild, but he was no Mitch Williams. And yes the "Wild Thing" moniker fit. So, no one's really done it since the era of Ruth. Kaufmann was the last to do it. He joined the Giants at age 28, played the outfield exclusively, and then left the Giants and returned to the mound. Anyway, it'll be pretty rare if Ankiel can pull it off. Given his sad recent past, I hope he can, but I highly doubt it. By the way, if by the title I made anyone think of the execrable Brad Pitt vehicle (think Pinto) "Troy" I apologize abjectly. Yesterday, John Smoltz returned to the mound as a starting pitcher after nearly a four-year hiatus, during which time he registered 154 saves and, if you hadn't heard, was a closer. Of course, Smoltz's move to the rotation is the latest effort by Atlanta manager Bobby Cox and pitching coach Leo Mazzone to challenge themselves. Revivifying near-dead ex-Rockie and ex-Indian pitchers was apparently an insufficient raisin d'etre when you've owned your division for every year dating back to the Coolidge administration. So, after winning 20 games and then saving 55 games, could John Smoltz again become a 20-game winner? I mean, wasn't the move to the bullpen necessitated by his reconstructed elbow? It's like Rocky III when Rocky can't even see out of his left eye, Mickey is dead, and somehow Apollo Creed's chicken-racing lessons allow the fighter to again become a champion while being completely upstaged by Mr. T.
Gary Bell's 14 wins in 1966 is the highest in the group. If Smoltz again becomes a premier starter, he'll be doing something that's unprecedented. Of course, we are limiting ourselves to the post-Joe Page era by throwing save numbers around. What if we just look at pitchers who first were predominantly starters, then were predominantly relievers, and finally returned to the rotation, what is the highest Win Share (pitching) total for these men and will Smoltz exceed it? These numbers are based on the pitchers' top totals per role. Smoltz's high in pitching Win Shares as a starter was 25.7 in 1996. His high as a close was 17.2 in 2002. That gives him a 42.9 total for the first two roles. Let's say he matches his 1996 performance this year. That would give him 68.6, just third on the list above. What does this tell us? Pitching roles were much more fluid—shocking!—a century ago then today. But given that El Tiante made the list in his odd, career-reaffirming season of 1972, relief pitchers also threw a bunch more innings prior to the last twenty, thirty years—shocking again—which made them more valuable. Finally, what it tells me is that no other organization but the Braves would ever be in a position to try something like Smoltz's return to the rotation. Given his success in the pen, no other coaching tandem would be secure enough to even attempt such a stunt. If nothing else, it reaffirms that Cox is the best manager of his era. If Smoltz again becomes a twenty-game winner it could be enough to put two men, Smoltz himself and Leo Mazzone, in the Hall of Fame. Too bad it's got to happen on the damn Braves. Kansas City is lost; I am here! —W.C. Fields on missing his destination in "International House"
—"Kansas City/Hey-Hey-Hey-Hey! ", the Beatles' version of the Little Richard classic. From 1936-54 Kansas City was a top minor-league team for the New York Yankee organization. The Blues won four regular season titles and two postseason ones in 1952-53. Starting in 1955, Kansas City was again a major-league city, returning to the majors after a forty-year hiatus. Arnold Johnson had purchase the moribund Philadelphia Athletics from Connie Mack's sons and shifted them out west. However, the KC A's were far from a major-league organization. As Glenn Stout put it in Yankees Century, they were the Yankees' "triple-A farm team masquerading as the Kansas City Athletics of the American League." The Yankees-A's relationship harkened back to the early days of the American League when players were shifted about to solidify big-city franchises, or even earlier to when syndicate ownership would allow one team to divest its partner team of all its talent and sent franchises like the Cleveland Spiders and Louisville Colonels the way of the dodo. The Yankees would dredge the A's system for talented young players like Clete Boyer, Roger Maris, and Bobby Shantz. In return the A's would receive various and sundry players that no longer held the Yankees' fancy. The Yankees would send quantity for quality (three-for-ones or five-for-twos) like in some primordial fantasy league. They also sent players out to KC for more seasoning and then recall them when they were ready to contribute at the Yankees' level of play (like Ralph Terry). Future Hall of Famer Enos Country Slaughter was exiled to KC when he started 1955 slowly and didn't return until the next season. All this made for a number of extra roster moves, mulligans, for the Yankees. Or as Weiss's assistant, Lee MacPhail explained, "We've got too many big leaguers and had to cut down. And we were not going to let them go for the $10,000 waiver price." The result for the A's was thirteen consecutive losing seasons. Actually, Bill James, boyhood KC A's fan he, in his 1986 Abstract looked even deeper and found that the A's had a losing record in 69 of the 78 months (excluding October) that they spent in Kansas City. "The best month that the A's ever had in Kansas City was July of 1959; they started that month 9 games out of first place, and finished 9 1/2 out. By the end of August, one month later, they would be 21 behind." As James explains, "The pinstripe pipeline rubbed the city at a raw spot, the rawest spot Johnson could have found. With every KC/New York trade the protests grew louder, the bitterness in them grew sharper." Their trade history was "enough to convict Arnold Johnson in almost any court, but it should be noted that the A's farm system in these years produced very little talent—maybe 2 or 3 players of quality. He had to try to come up with young players from somewhere. Unfortunately, what he tried didn't work." After Johnson died, the A's were sold to Charlie O. Finley at the end of 1960. Aside from various uniform changes (from "Athletics" back to "A"s on the shirt fronts, from blue and white to red-white-and-blue unis to the green-and-yellow we know today), Finley would abandon dealing with the Yankees. After trading Bud Daley, James explains, "the public was outraged. Finley and his new General Manager, Frank Lane, promised the Kansas City public that there would be no more Yankee trades." In 1968, the A's shuffled off to greener pastures in Oakland. After 18 straight losing seasons, five in Philly and 13 in KC, they registered their first winning season in their first year in Oakland and went nine straight years without another losing season, during which they won three World Series and five division crowns. Now, that's the legend and legacy of the Kansas City A's. And given that, I expected to find any number of lopsided KC-to-Yankee trades in my previous research When I not only found no lopsided trades, but rather found one (i.e., for Jerry Lumpe) listed among the most even ever, I was considerably nonplussed. Then it occurred to me that these trades cannot be viewed like other trades. I have evaluated transactions throughout this series based on a point-in-time approach. The trade is made independent of what transactions those some players may be involved in in the future. The GM makes the transaction given the previous performance of the players involved as well as his expectations for their performance. Whether he guessed right can be evaluated from the post-transaction performance, which I measured in Win Shares (WS Above Baseline, actually). However, a nexus is built up based on this transaction and its subsequent transactions, each of which have attendant expectations and realities. Sometimes an acquired player who is expected to perform at a certain level does not do so until he has been subsequently traded. I have decided to treat each transaction separately and have evaluated them accordingly. Therefore, I rated the Glenn Davis for Curt Schilling, Steve Finley, and Pete Harnisch trade as the second-most lopsided ever even though the Astros didn't get that much directly from the trade. Harnisch, the least valuable overall of the three, was the most productive in Houston. Finley was traded before he developed into a power hitter, and Schilling spent just one year in the bullpen. My response to that is a) the Astros should not be penalized for future poor transactions when one good trade is being evaluated and b) that way leads only madness…I'll explain. If in evaluating transactions, one follows each of those transactions to the bitter end, a nexus of interconnected transactions over years will be created, and subsequent mess will defy explanation. Never mind that team management and ownership, not to mention team performance, needs, and surfeits may change over the course of this interconnected evaluation. The whole idea that a trade is made at a point in time is lost. If a team expects a certain level of performance from a player within five years and when he does not meet those expectations, the team subsequently trades him, they do so with the knowledge of what he has done over those five years. To connect the second trade to the first is to assume that the team knew how the player would perform in between those two trades. For everyone who's complained about my point-in-time approach to trades, that's the best explanation that I have. I stand behind it even if I can’t explain it well. However, in the case of the Yankees and KC A's transactions, one cannot evaluate them as a point in time because that was not apparently how they were approached by the teams involved. The Yankees sent a player to A's with the knowledge that the player could be re-acquired if needed later. So how can one evaluate these trades and avoid the madness I mentioned earlier? My solution is to use interstitial trade values, that is the value that each team derived directly from the trade, prior to any subsequent transaction for the given players. You'll notice that overall the Yankees have traded experience (191 Pre Career WS to the Sox) for future production (1008 Post Career WS to the Yankees). That's true in macrocosm (i.e., career stats) and in microcosm, that is within the given season (4 Pre Year WS and 8 WSAB Pre Yr vs. 76 Post Year WS and 88 WSAB Post Yr, all in the Yankees' favor). One other thing is that the Yankees have traded quantity, experienced quantity (42 WSAB Pre Career to the Yankees and 191 Pre Career WS to the Sox). Finally, even though these two teams were extremely active dealing with each other in the first four decades of the century, their proclivity to trade with each other dried up in the Forties, when their rivalry is generally acknowledged to have begun in earnest. Trade: Yankees purchase Babe Ruth from the Red Sox. Big surprise here. This is the most lopsided transaction of all time. Trade: Red Sox trade Red Ruffing to Yanks for Cedric "Don't Call Me Fred" Durst and $50 K.
Another Hall-of-Famer acquired in his prime (age 25). In the Sox's defense Ruffing showed very little of his future success in his six-plus seasons in Boston (only one park-adjusted ERA better than league average and a 39-96 record). Then again, Durst wasn't much of a player and he was 33 with one partial season left in his tank. The Red Sox inserted him in outfield apparently as a starter for the first and last time in his career. Trade: Red Sox trade Waite Hoyt, Harry Harper, Mike McNally, and Wally Schang to Yankees for Muddy Ruel, Del Pratt, Sammy Vick, and Hank Thormahlen..
Hoyt was another future Hall of Famer, acquired when he was just 21. Schang, Pratt, and Ruel were also productive players, favoring the Sox slightly in the non-Hoyt side of the trade. Trade: Red Sox trade Herb Pennock to Yankees for Camp Skinner, Norm McMillan, George Murray, and $50 K.
Yet another future Hall-of-Famer, Pennock, this time acquired at age 29. Trade: Red Sox trade Carl Mays to Yankees for Allan Russell, Bob McGraw, and $40 K.
Mays wasn't a Hall-of-Famer (at least he hasn't been elected yet), but he was close, and he sure looked like one on the Sox. Russell had some success with the Sox and Senators. He actually won more games in 1919 after the trade than Mays (10 to 9). Trade: Red Sox purchase Billy Werber from Yankees. The Sox finally take one, and it's Billy Werber?!? Werber was a pretty good third baseman for the Sox before the sent him to the A's after three seasons. Trade: Red Sox sent Sparky Lyle to Yankees for Danny Cater and a player to be named later (Mario Guerrero sent June 30). This is one that people usually point to after Babe Ruth, I guess because it is fairly recent (the Sox fans have forgotten their Werber conquest apparently). Lyle was a good pitcher for the Sox before the trade. He was their relieving ace, pitching 100+ innings in 1969 with a 2.50 ERA. The Sox must have looked at his mediocre 1970 season, his falling innings totals n 1970-71, and his falling strikeout totals in 1971 (only 37 in 52-1/3 innings) and thought that even at 26, his best days were behind him. He had a big first year with the Yankees (career high 35 saves) and pitched a ton of inning effectively for them and the Rangers for about a decade. Cater was a standard issue corner outfielder-first baseman with a funky batting stance. Though he had batted .300 just once prior to the trade, he did finish in the top 10 in batting in a pitcher's era (including a second-best .290 in 1967, the year Yaz won the batting title with a .301 average). Pat Tabler is his most similar batter, so that should tell you something. Trade: Red Sox sent George Pipgras and Harvey Hendrick to Yankees for Al DeVormer. Pipgras was a 23-year-old prospect that would go on to win 24 games for the Yankees in 1928 and 57 over three years (1928-30). Hendrick, also a rookie, was a corner outfield-first base type who had some offense and very little defense. DeVormer was a 30-year-old backup catcher with just 127 ABs under his belt at the time. He split time behind the plate with Val Picinich in 1923 and then was, other than a cup of joe with the Giants in 1927, was through in the majors. Trade: Boston Somersets purchase Tom Hughes from Baltimore Orioles. A second win for Boston and it comes when the Yankees were still in Baltimore. Hughes won 20 games for Boston in 1903 and then was traded back to the Yankee franchise, now in New York and known as the Highlanders, for Jesse Tannehill, who won 21 and 22 games over the next two years for Boston. Hughes was 7-11 in part of a season with the Yanks and then was sent to Washington for Al Orth who won 27 games for the Highlanders in 1906. Trade: Yankees send Lefty O'Doul, Chick Fewster, Elmer Miller, Johnny Mitchell, and $50 K to the Boston Red Sox for Joe Dugan and Elmer (J.) Smith. The Yankees give up too much to get two veterans? The trade drew a protest from then contending St. Louis, causing Commissioner Landis to change the rules to bar non-waiver trades after June 15. O'Doul was still a young pitcher when the Yanks shipped him to the Sox. He would blow his arm out in Boston and then go back to the PCL to turn himself into a very good batting outfielder with the Giants, Phils, and Dodgers. (Also when in San Francisco, remember to visit Lefty O'Doul's pub. I have a menu from there that I kept as a souvenir.) He was the prize of the trade though the Sox didn't directly benefit from it. Smith stinks up the field in NY (.185 batting average), and survives only one more year with the Yankees (122 OPS+) and two more years in the majors. Dugan was the Yankee third baseman and leadoff hitter for many years. So even when the Red Sox "win" one, they don't benefit from it. Trade: Boston Pilgrims send Patsy Dougherty to the New York Highlanders for Bob Unglaub. This was a trade that was highly criticized in Boston in its day. Some theorized that it was orchestrated to help the Highlanders compete with the Giants. Dougherty played well for the Yankees until he got into a fistfight with manager Clark Griffith in 1906 and was waived. He then became part of the "Hitless Wonder" White Sox. Unglaub was a weak-hitting first baseman, who started just one season in Boston. Six games after the trade he was hospitalized for blood poisoning. Next, we'll look at the oddly incestuous relationship between the Yankees and the Kansas City A's in the Fifties and how this affected their trading approach. Vetted Hall to Induce New (Tommy) McCarthyism? Proving once again to be rigid guardians of the gate to Cooperstown, the National Baseball Hall of Fame's Veterans Committee did not elect any of the 25 candidates on its 2005 ballot. Gee, it almost makes gridlock sound ennobling. "Honey, it took me three hours to get home today thanks to the rigid guardians of traffic flow. God bless them." I guess how else can they sell the catastrophe that is the new Vets Committee? Anything less would be admitting defeat, which is something that they'll have to do soon. You may notice that nothing has changed very dramatically since the last Vets Committee vote. Kaat had a 27% bump, but that was after he fell off the Baseball Writers ballot. The largest increase from the last election was by Joe Torre, who is of course active as a manager, which helps, and still only received 45% of the vote. By the way, I also have a full rundown of the candidates here. As for the Veterans Committee, no one has been inducted into the Hall by that august body since Bill Mazeroski and Hilton Smith in 2001. Now we'll have to wait another two years, barring a procedure change, for another Vets Committee inductee. That'll be at least a six-year gap. The baseball writers had a six-year gap between picking new Hall-of-Famers from 1956 to 1962. It also had five-year gap from 1942 to 1947. In response the Veterans Committee of the Forties inducted a flotilla of substandard players forever lowering the standards of the Hall in the first place. They inducted 10 in 1945 and 11 in 1946. Included among them were Tinkers-to-Evers-to-Chance, probably the worst player in the Hall (Tommy McCarthy), and possibly O'Brien-to-Ryan-to-Goldberg. I'm not sure. And what damage was left undone by the Veterans Committee of the Forties, was taken up by the Vets in the early Sixties. So what will this austere period in the Veterans Committee reap in future elections? How about Juan Gone into the Hall? The caretakers of Cooperstown will not stand idly by with empty election classes. There will be a reckoning. It reminds me of the BBWAA elections in the Forties. Most of the more obvious choices had already gone into the Hall even though there were a number of qualified candidates. However, no one percolated to the top when left to an open vote. This year four candidates received at least 50% of the vote, something that has guaranteed eventual admittance in the past. What can and should be done to right the Veterans Committee's course? They could get the list down to a more manageable size, say, ten candidates. They could have a runoff, in which the top five or ten vote-getters go through an addition round to help them amass the necessary votes (something that was imposed on the BBWAA system in both the Forties and Sixties). They could guarantee that the top-voter gets in automatically (also done in the Forties). Whatever they do, the Hall's history tells us that something will have to give. If it's not a minor tweak like the ones I itemized above, a major backlash, like the Vets Committee open-door policy in the Forties and Sixties, will await us as the qualified candidates well up and the number admitted slows from a trickle to nil. No spring training games have yet been played and yet Trot Nixon is already filling the Yankee bulletin board with quotes about Alex Rodriguez. He's not a "Yankee type". He's a "clown" for getting up at dawn to run stairs while Nixon is admittedly sleeping and driving his kids to school, hopefully not at the same time. Nixon also opines that regarding A-Rod's three-month-old infant, "He's got a kid now, too, so I guess he'll have his limo driver take her to school." I guess Nixon started school right out of the womb: that's why he's so proficient at them there fancy ciphering. Sheez, how would Boston have reacted this offseason if they hadn't won the World Series? Hanged A-Rod in effigy, or maybe actuality? The Red Sox did complete what has been called by many (especially Curt W. Schilling) the greatest comeback in sports history beating the Yankees in the ALCS. Why all the sniping now? So it goes in what the media seems to think is the greatest rivalry in baseball history. Sorry, Dodgers and Giants. Your bi-coastal rivalry that helped end Jackie Robinson's career is now just a footnote. The "Shot Heard 'Round the World"? Eh, it doesn't compare to "The Comeback", Jeter's grab in the stands, or the "Tek"/A-Rod-induced brawl. It's been devalued to the also-ran level of, say, the "A-Rod Slap" or the "First Annual Don Zimmer Toss". Of course, it all dates back to that dreaded and accursed day when the Red Sox sold the great Babe Ruth to the Yankees so that, the apocryphal legend goes, then-owner Harry Frazee could produce "No, No, Nanette". This is the single event other than Robin Williams discourse on the Fisk homer in "Good Will Hunting" that occurred prior to last year's World Series win in the Red Sox fan's view of the world (a truly desolate wasteland like in the famous "New Yorker" illustration). I think some fans would be surprised by not only the total lack of rivalry in the early years, but by the fact that they were even comrades, "Insurrectos", that faced off against AL founder and then-president Ban Johnson. Frazee eventually mortgaged Fenway to the Yankees as a countermove in this ongoing war. The Yankees almost moved into Fenway as a further countermove, according to historian Glenn Stout. Imagine the Yankees and Red Sox amicably sharing a stadium today. First, we'll start with a BA table, as is my wont. Below are all the transactions that the two clubs have had throughout their history. The first couple of transactions actually predate the Yankees and the Red Sox. They were between the old Baltimore Orioles (precursor to the Yankees) and the Boston Somersets (who wouldn't be known as the Red Sox until they swiped the name from the Boston NL club in 1907). Trades, player purchases, waivers picks, and Draft 5 picks are listed. Each player is listed for each transaction along with his Win Share totals. That is, his career WS prior to and following the trade are listed along with his WS totals for the season in which the trade occurred, split up by prior to and following the trade if midseason. Also, the WS values are all translated into Win Shares Above Baseline (WSAB). After each transaction, running totals for all trades up to that point appear. The positive values in the running totals favor the Yankees; negatives the Sox (don't feel slighted, Red Sox Nation—it's arbitrary). At the bottom is a breakdown of the transaction totals per decade. You'll note that the Twenties, which kicked off with the Ruth sale, were a huge plus for the Yankees. But you can also see that the first decade of the century was a big plus for Boston and helped build their early dynasty. From the 1910s through the 1970s, the Yankees pretty much owned the Sox in their mutual transactions, though the Sox have "won" their scant few trades since. Next, we'll look at their biggest individual transactions.